For elite bodybuilders and athletes like you, timing your protein intake can work wonders for your physique. 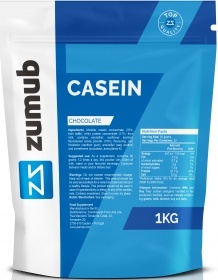 If you are looking for a complete protein source that will keep your muscles nourished for extended periods of time, the answer is none other than Zumub Casein! Casein is a complete protein source, which means that it boasts of all the Essential Amino Acids (EAAs), including Branched Chain Amino Acids (BCAAs) that are used for building, repairing, and protecting lean muscle tissue. Unlike whey protein that digests quickly, casein is known for its slow-absorbing properties – making it just the right protein shake to consume in-between your meals or right before you head to bed at night! What benefits do you get by consuming casein protein? As soon as casein enters your digestive tract, it forms into a gel-like substance that gets digested at a slow rate – creating a steady supply of amino acids for your muscles. This is why it is a good idea to consume casein for those times when you won't have access to a full meal for many hours. Zumub knows how important it is to consume the right amount of protein, so Zumub offers you the best without saving on quality at a competitive price - almost 22g of protein per serving, with less than 2g of sugar and fat. With Zumub Casein working for you, you can expect to wake up each day with stronger, harder, and more powerful muscles! 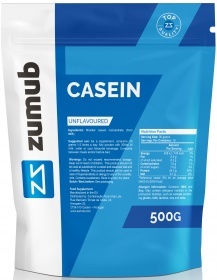 Experience ultimate muscle-building support that lasts for many hours at a time... try Zumub Casein today! ALLERGEN INFORMATION: Contains Milk and Soy.,May contain allergens handled in the production facilities, such as cereals containing gluten, milk, lactose, soy, nuts, sulphites, peanuts or sesame seeds. As a supplement, consume 30 grams 1-2 times a day. Mix powder with 300 ml of Milk, Water or your favorite beverage. Consumed between meals and/or before bed. WARNINGS Casein : Do not exceed recommended dosage. Keep out of reach of children. This product should not be used as a substitute for a varied and balanced diet & healthy lifestyle. This product should not be used in case of hypersensitivity or allergy to any of its constituents. Contains sweeteners. Store in a cool, dry place. BEST BEFORE: Please see lot number and expiration date stamped on the packaging.